In the library I run a reading development activity called Accelerated Reader. After an initial online comprehension test, children can go and read fiction or non-fiction books and then when they finish, they login to take a fun quiz on the content of the book. Everyone in Year 7 and Year 8 are working towards their reading goals. When children get a high score on a book quiz they win a prize. 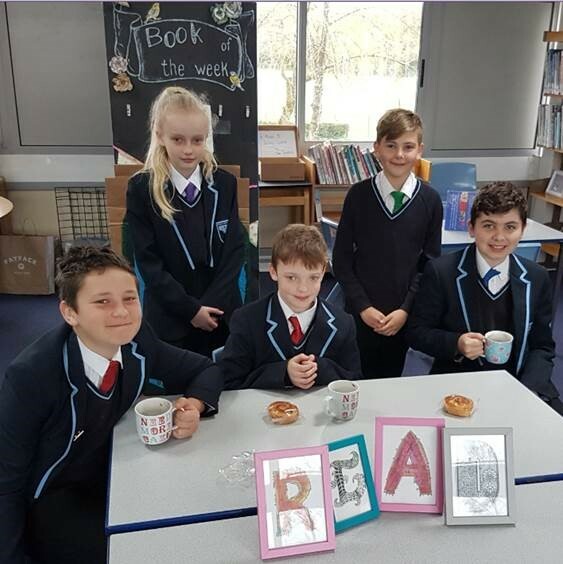 These children joined me in the library on a Friday morning at tutor time to enjoy a luxury hot chocolate and pastry to kick off their day! We would really love for all of our students (in every year) to be reading for pleasure for at least 20 minutes per day. There is nothing wrong with being read to either – so why don’t you dust off your favourite book, put on your best funny voice, and share it with your child at bedtime. Well done to Ella, Daniel, Jake, Elliot and Alfie on their High Scores.